Estratego International have been offering support to teams and the sport since the beginning of the Millennium Series with brands such as Tomahawk paintballs, Totem Air Products and Buddha Paintball. Tomahawk is a high quality European paintball brand and the oldest sponsor of the Millennium Series for over 10 years. With a fast growing network of dealers throughout Europe, Asia and South America, Estratego/Tomahawk enlarges its list of friends every year, founding new partnerships and business opportunities to extend our products to the global community. PRESS RELEASE: Toulouse Tontons 2 to play Div 1! Toulouse Tontons are pleased to confirm that in 2010 Toulouse Tontons 2 will be playing in Division 1 as a sister team to their CPL team. London Shock are pleased to announce that their sister team, London Shock 2, will now be competing within Division 1 throughout the 2010 season. Joining the CPL team and Division 1 team is London Shock 3, who will be playing in Division 3 this season also! Gelkaps is pleased to announce its full support as a Platinum Paintball sponsor for the premier Millennium Series Paintball Championship for the 2010 season. Gelkaps Paintballs are distributed throughout Europe by Phoenix Paintball UK Ltd, with its full range of Celtic and Strike paintballs "We look forward to meeting all in Europe at our stand on sunny Malaga beach, where we will have a full supply of paint and team support programme. Any teams wanting to know how to get their hands on these new exciting brands should contact Kim Ovrid, Celtic's European team coordinator Email kim@celticpaintball.com . Any interested dealers or potential distributors should contact sales@celticpaintball.com and we would love to meet you in sunny Spain!" M5 Division now full for Malaga! Division M5 is now full for Malaga - places remain within Division 3 R2:2 Format for teams who still want to participate at this event though! PRESS RELEASE: Toulouse Dagnir Dae will play in the CPL in 2010! 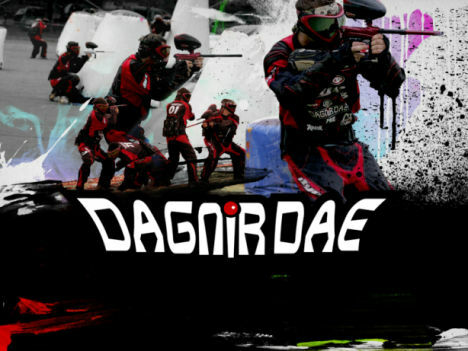 Dagnir Dae Team is 17 years old; 17 years of paintball, 17 years of passion and also 17 years of sport. We are proud and excited to enter a new area of our Team life. We have decided to take on a new challenge and to play in the Champions Paintball league (CPL) in the Millennium Series in 2010! To be able to compete with the best in European Paintball is a chance we just had to take. As always, the companies that support us will give us the means to advance and evolve in this category. We will proudly represent our club Dagnir Dae (Paintball Evasion), our shop www.shop-paintball.com (Aventure Paintball Park), our city : Toulouse, our nation: France and all the people and companies who support us. PRESS RELEASE: San Diego Dynasty Impact will play in the CPL in 2010! San Diego Dynasty and Edmonton Impact have been battling it out against each other in the US in both the NPPL and the PSP as two of the few teams committed to both leagues. Both teams have also made some big pickups for the 2010 season with Impact adding Dave Bains and Ryan Moorhead and Dynasty adding Chad George and Glenn Takemoto. For 2010, these two top teams from the states will be teaming up as San Diego Dynasty Impact for the Millennium Series and competing in the CPL. "Impact is a great team, we are both Eclipse and RPS teams, and we've played with a lot of their players over the years so this is a perfect partnership," said San Diego Dynasty Captain Alex Fraige. The Millennium Roster will include Dave Bains, Justin Cornell, Zach Yachimec, and Josh Oumet from Impact and Ryan Greenspan, Yosh Rau, Archie Montemayor, Justin Schwarz, and Alex Fraige from Dynasty. "I think we've got a great team headed over there, and should do very well," said Impact owner Bart Yachimec. "Everyone on both sides is excited about our chances this year in the Millennium." San Diego Dynasty Impact will be shooting Eclipse Ego and Geo markers and using RPS Paint at all 4 Millennium events this year. Sewell NJ, March 9, 2010 - Valken is going global! Valken Sports has arrived in Europe and joined forces with The Millennium European Paintball Series as a Platinum Gun sponsor. Along with their Platinum level sponsorship package, Valken will also have their own custom field. Valken President and CEO, Gino Postorivo said "Valken is truly becoming a global paintball force and we look forward to meeting our European customers, establishing new partnerships and making Valken products available in the European marketplace". "I, along with members of the U.S. Valken team, will be in attendance at each of the Millennium Series events and we are very happy to become a partner with the Millennium Series", added Postorivo. Valken is seeking 1 major distributor in each respective European marketplace to solidify a foundation for their ever-expanding distribution network. Please send dealer requests to info@valken.com. The 2010 Millennium European Paintball Series venues are; Malaga Spain, Bitburg Germany, London England and Paris France. Teams scheduled for competition will come from as many as 30 countries. For more information on the Millennium European Paintball Series, please visit www.millennium-series.com. Valken Sports is the exclusive distributor for Redemption, Crusade, Fate, Exile, Go to www.valkenpaintball.com for more details. 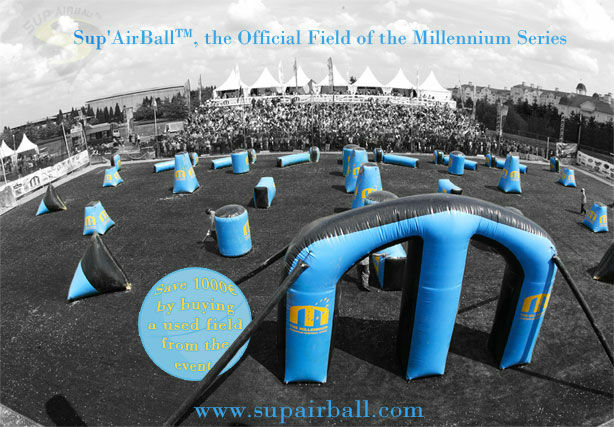 Changing the game we play, Sup'AirBall introduced the first generation of inflatable paintball bunkers back in 1996. Since then, Sup'AirBall has continued to advance and refine our bunkers year after year, now offering a large selection of shapes and full range of products including the Pro Series line but also a wide range of Woodsball/Scenario bunkers. With three distribution centers around the world, Sup'AirBall is the world's leading producer of inflatable paintball fields. Sup'AirBall is proud to be the official field of the Millennium Series, one of, if not the, greatest Paintball Tournament Series in the world. Keep in mind that Sup'AirBall offer great deals on the used fields from the Millennium events. Save big on a field used for only three days. Each field comes with a full year manufacturer's warranty.